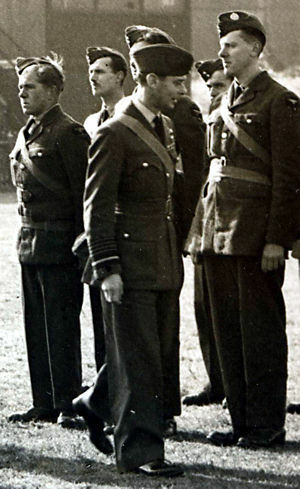 Cyril joined the RAF before the war when he was 18 years old. Leading Airman 619449 Cyril Moore was part of a RAF Barrage Balloon Squadron managing about eight barrage balloons before, during and after the Battle of Britain. They were huge balloons, filled with carbon dioxide gas that floated in the sky, designed to form a physical barrier to incoming planes and flying bombs. They forced aircraft to a higher altitude thereby decreasing bombing accuracy. Anti aircraft artillery guns and fighters could then concentrate their efforts at the same altitude thus reducing time and increasing accuracy. His brother Ron can remember that Cyril’s first posting was in Falmouth, Cornwell protecting the Port. Early in the war, Falmouth was for a time the most-bombed and mined area in the country, the Docks being the prime target. Cyril was then posted to B flight, No. 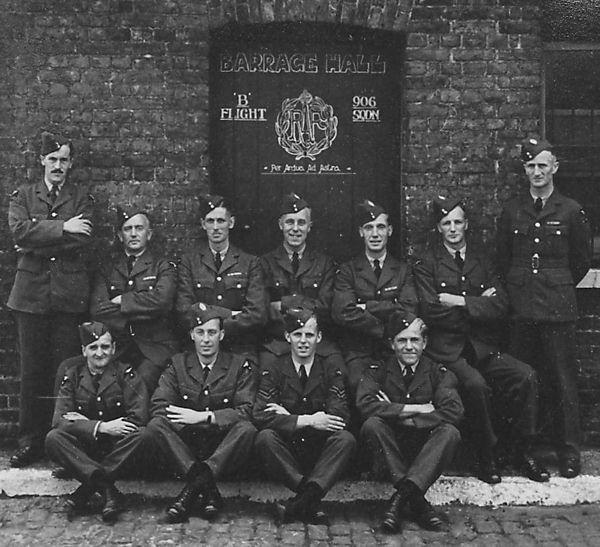 906 Barrage Balloon Squadron based in Hampstead north London. They were issued with 45 barrage balloons. Ron, who was 10 years old at in 1939, went to visit his older brother with his Mum. He can remember going to Camden and seeing Cyril’s Barrage Balloons. He can also remember that Cyril was a ‘ladies man’ and always had the girls after him. Steel cables were attached to the balloon and anchored to the ground. You can see some of the cable anchorage points on the photographs on this page. The balloon was raised or lowered to the desired altitude by means of a winch. The steel cable was also a physical obstacle which if hit by the wing of a plane would cause it to crash. During the height of the Blitz bombing attacks on London, 102 German aircraft struck cables, resulting in 66 crashed or forced landings. The barrage balloon was seen as a viable means to counter low-level German bomber and Stuka dive-bomber attacks. Thousands of barrage balloons dotted the British skies. 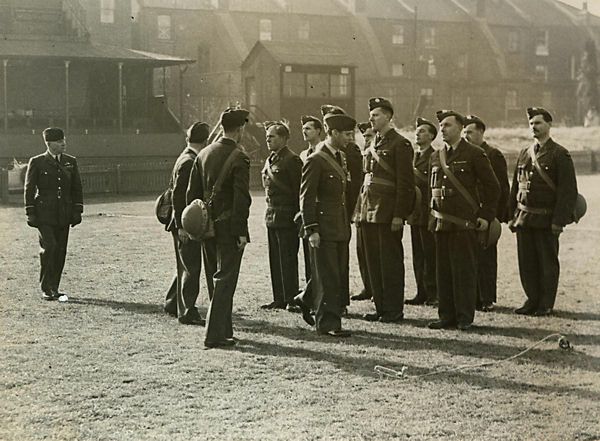 In this photograph you can see Cyril (without Moustache) standing at attention in the extreme left of the front row as King George VI inspected his unit in 1939. This was a barrage balloon unit in north London. 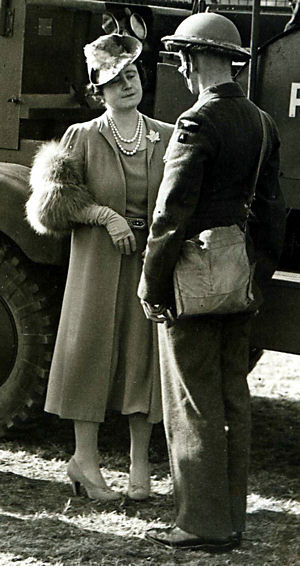 The lady in this photograph with King George VI was the Queen, the future ‘Queen Mother’ of Queen Elizabeth II. 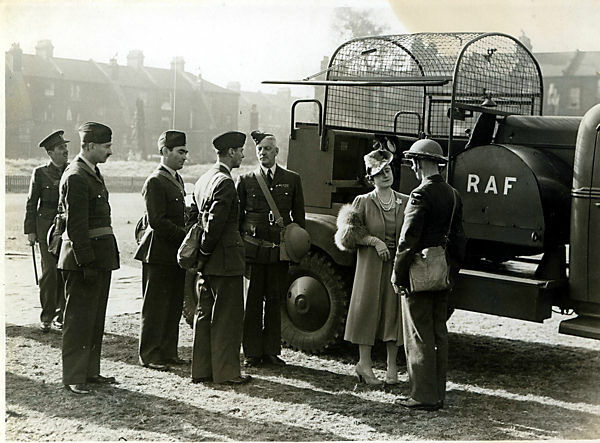 The King and Queen are inspecting the barrage Balloon winch that was secures to the back of a lorry.